Oleotec Ltd were investigating a wave energy converter which extracts energy from the longitudinal compression of waves from the ocean. As part of this investigation, Wilde were requested to perform finite element analyses on a number of potential design scenarios. 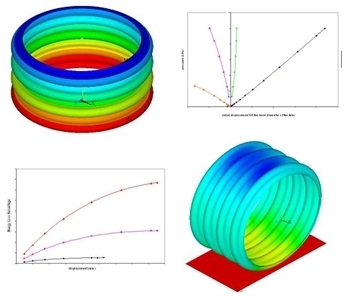 The finite element simulations were conducted using ANSYS. Geometry was created and meshed in ANSYS. The deflection of the energy converter was modelled to reflect the air pressure change inside the device, i.e. air pressure increases with device being compressed and decreases when being stretched. The results were analysed and significant graphs were plotted, shedding light on the energy loss percentage and the stiffness characteristics for different configurations. FEA was undertaken to predict the wave energy loss due to the structural deformation of the device. Varied wall thicknesses, dimensions and materials were investigated to examine the sensitivity of the potential configurations. Weight analysis was also conducted to identify any transportation issues.